Bathrooms are among the spaces in your house that suffer a substantial wear and tear. The regular showers, toilet flushes, as well as the on and off sink usage burden your plumbing system making a replacement inevitable. Whether you want substantial work or a cosmetic repair, it’s important you understand the signs that your plumbing system needs a change. When you notice rust and chips starting to appear or your skin hardware becoming difficult to clean, an upgrade may be what you need. Older hardware makes your bathroom look dated and to some extent it can prove dangerous to your health especially when the chipped metal bits end up in your water stream. A professional plumber or handyman can help you replace this hardware. If water dribbles out from around the fixture when you turn your sink tap on or a pool of water forms on the floor if you run your tub, your hardware may be in need of fixing. Faulty waterlines are one of the major causes of incessant drainage issues. If you are a DIY expert, you can try flushing your drains with homemade or commercial cleaners such as soda and vinegar to eliminate any clogging. However, if the drainage issues still persist, you should request for a replacement of your drain hardware. The water in your shower is meant to come out full blast. At times, this may not be the case because of corrosion in pipes. Galvanized steel pipes usually degrade overtime and their diameter narrows thereby decreasing the water volume. This is usually manifested in tubs, sinks, and toilet refill rate. To do away with this problem, you need a full pipe replacement. This problem is evident in water heaters. 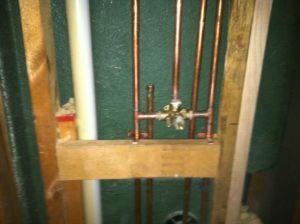 Usually, water heaters contain sacrificial anodes which are basically steel rods covered in magnesium, zinc, or aluminum. The role of these rods is to attract bacterial and corrosive elements present in the water tank so that they do not enter your pipes. Over time, the rods may waste away and breakdown thereby stopping to function. This causes your water to be rust colored and even smelly. 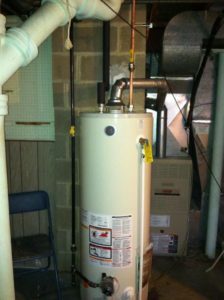 To fix this problem, you will require a new water heater. This is another sign that some of your plumbing requires replacement. When you see mold accumulating on your ceiling or walls, it simply means there is water running in a place it shouldn’t. The earlier you find the leak and fix it, the better for the integrity of your house.